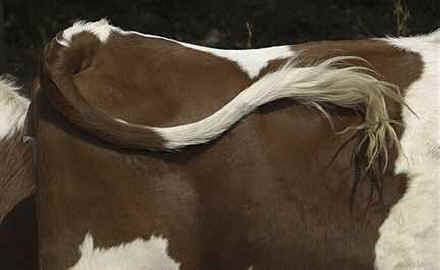 A cow's tail, as you know, is incredibly important. It is used to protect her from flies and other annoying pests. It can also be used to communicate with other cattle. Cows in California can no longer be routinely tail-docked as of October 2009! The Governor of California signed into law SB 135 which bans the amputation and mutilation of cattle tails. The practice occurs on dairy farms where milkers have to milk from behind the cow - sometimes they get swatted in the face. Animal Place's Sadie (black and white cow) was tail docked before arriving at the sanctuary. She received extra care during the summer months to protect her from the flies. No cow in California will have to endure this painful process anymore! If you want to help cows further, consider switching from dairy milk to soy or rice milk!